In 1947, the long-widowed Mary Louisa James Burns wrote to R. C. Heaton in Paso Robles, California. She sent him a history of her father, Drury Woodson James, a founder of the town. In 1905, Heaton had purchased the home Drury Woodson built for his family, the same home in which Mary Louise was born. The residence was one of many buildings Drury Woodson James built as part of his El Paso de Robles Hotel, around which he built the town of Paso Robles. 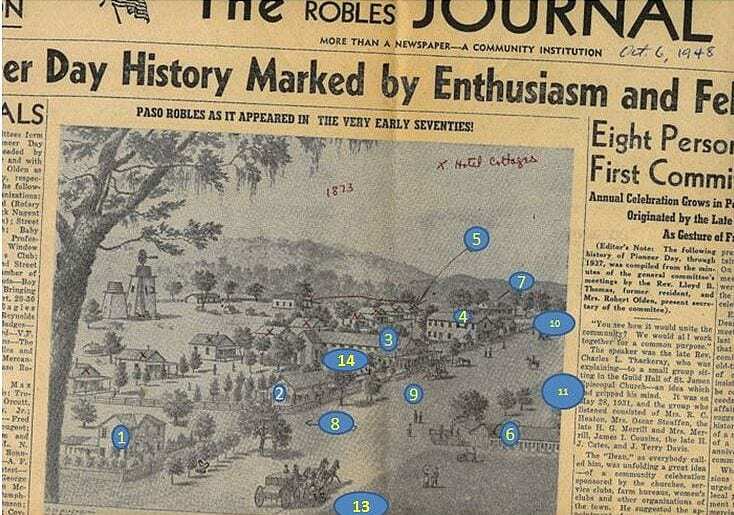 In one correspondence, written by her granddaughter Mary Joan Malley Beamis, Mary Louise James identifies and tags the early building of Paso Robles. Mary Louise James Burns identifies landmark locations of the buildings of the El Paso de Robles Hotel, built by her father Drury Woodson James in Paso Robles, California. 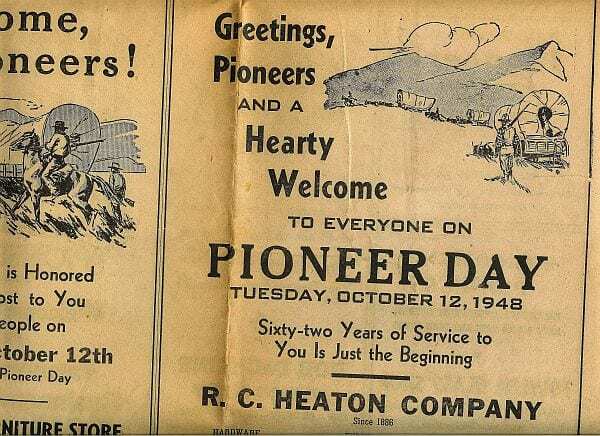 The locations are pictured in an engraving published by The Paso Robles Journal, Oct. 6, 1948. This is from a wood cut. I have the original copy. 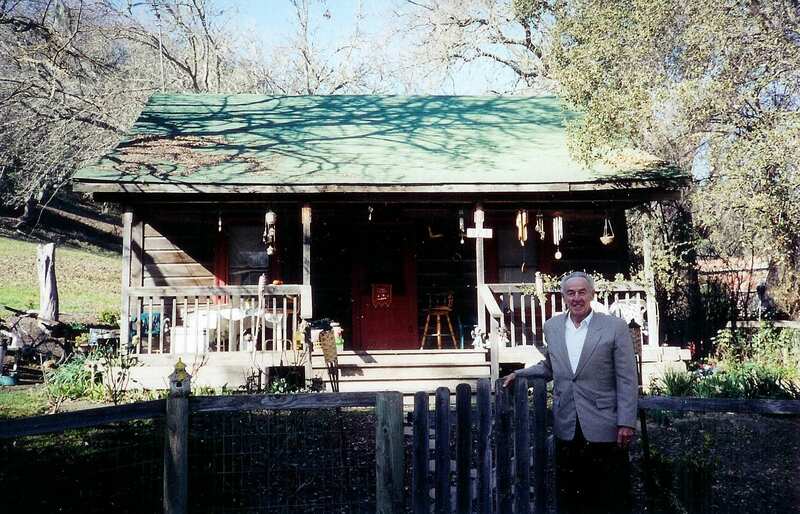 D. W. James Home – 1969 or 70. I was born in this house. A very good likeness considering. South Cottage where your “Nana” was married (long cottage). Patsy Dunn store. (Ed. : D.W.J.’s father-in-law Patrick Dunn) My father moved this and we used it for storage for many years. It was torn down in 1960. The Ralston Cottage, or at least its location. Bath House – original – another was built here but burned in about 1910. Old Stage Road, now Spring St.
Dear Mrs. Burns: Thank you for the copy of your father’s history sent me by the Paso Robles chamber of commerce at your request. I have it filed away in the history of San Luis Obispo county. 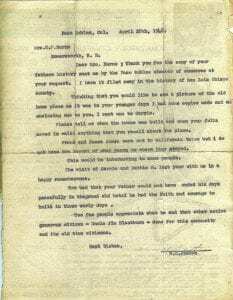 Letter from R.C. Heaton to Mrs. Edward Frederick Burns (Mary Louise James), daughter of Drury Woodson James, founder of Paso Robles, California. 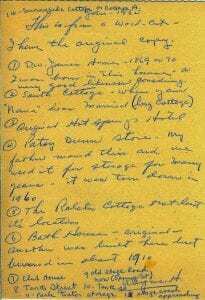 References to Carolina F. “Carrie” James Maxwell and Helen “Hattie” James Bennett, sisters of Mary Louise James. 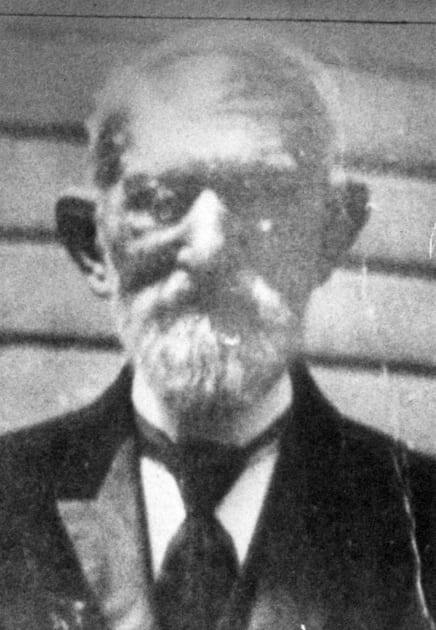 “UncLe Jim Blackburn” refers to James Hanson Blackburn, brother of Daniel Drew “D.D.” Blackburn, both partners of D.W. James. Thinking that you would like to see a picture of the old home place as it was in your younger days I had some copies made and am enclosing one to you. I sent one to Carrie. Please tell me when the house was built and when your folks moved in – also anything that you recall about the place. 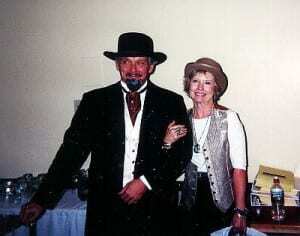 Frank and Jesse James were out to California twice but I do not have the record of what years or where they stayed. This would be interesting to some people. The visit of Carrie and Hattie B. * last year with us is a happy remembrance. Too bad that your father could not have ended his days peacefully in the grand old hotel** he had the faith and courage to build in those early days. Too few people appreciate what he and that other active generous citizen – Uncle Jim Blackburn – done for this community and its old time residents. * The references to Carrie and Hattie is to Mary Louise’s sisters Carolina F. James Maxwell and Helen James Bennett. ** The reference to the grand old hotel is to the larger resort hotel D. W. James built in the rear of the original pioneer stagecoach hotel. The Springs Hotel burned to the ground in 1910. 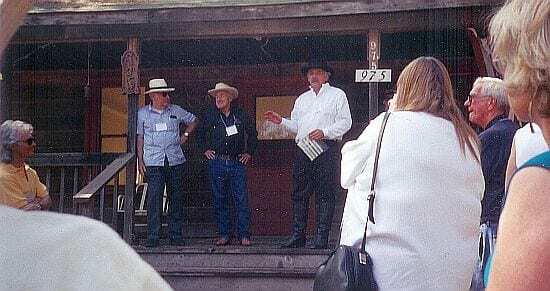 In 2002, the friends and family of Frank & Jesse James reunited at the Paso Robles Inn to celebrate Drury Woodson James. Our first full day of lectures at the James Family Reunion in 2002 left us feeling a bit of cabin fever. What better relief than to take a day trip to visit the cabin that Frank & Jesse James occupied during their visit with their uncle Drury Woodson James between 1868 and 1869. When Jesse & Frank visited Paso Robles, Drury Woodson James was not entirely welcoming of their visit. A preliminary visit by Frank was required to convince Uncle Drury to allow the visit for the purposes of Jesse using Drury’s ancient hot springs to recover from the two bullet shots he was carrying in his chest. As Jesse gradually recovered and put on a little weight, Drury employed his nephew with his vaqueros who worked Drury’s La Panza Rancho. As much as Jesse would have like to be considered an experienced cattleman, the vaqueros knew better. Jesse’s ropes were brand new and not woven like the ropes of the vaqueros. They laughed at Jesse as they would at any tenderfoot. During their visit, Frank and Jesse visited San Francisco. They also took an exploratory trip to Hangtown, in search of the burial site of their father, Rev. Robert Sallee James, who had died of cholera shortly after his arrival. A forest fire had ravaged the cemetery, burying many of wood grave markers and crucifixes, their father’s own among them. To present day, the exact burial site of Rev. Robert Salle James remains unknown. The day trip ended at the Norman Vineyards. Owner Art Norman entertained us, showing us how wine is made. He then generously shared his product with us. The Jesse James family was utterly surprised when Drury Woodson James showed up, alive and in person, at their family reunion in 2002, even though the event program announced he would be there. When Drury was scheduled to appear, Judge James R. Ross and myself were just looking to insert a little diversion into the program, more as a fun break from some of the serious presentations and content that had gone before. Little did we expect that Drury’s appearance would throw the remainting events off schedule when people started lining up to have their photos taken with him. When I agreed to enact D. W. James, I thought nothing of it. After all, I was retired from a sixteen-year career as a professional actor. I hadn’t given a second thought to the fact that it had been a long time since I had been on the stage or appeared before a large audience. When I left the meeting room to go put on Drury’s costume, something strange seemed to be changing in my body. When I had put on the costume completely, I finally added my hat. Suddenly, a surprising panic seized me. My costume smothered me in a gigantic envelope of unexpected stage fright. As the presenter continued on in the other room, I sat outside, waiting for the time for my appearance. I had written no script. Everything I was to say was supposed to be extempore and improvised. I had a list of key points about Drury’s life that had to be made. But, for the life of me, my mind was starting to lose everything I had learned about the man. As the moments crept on, I was losing more and more of my memory of Drury Woodson James. As the applause for the earlier speaker died down, I threw open the door, and Drury Woodson James entered the room to meet his guests at his Paso Robles Hotel. He was well met with appreciation. Everyone enjoyed being with him as he enjoyed their company, too. He was very comfortable among his hotel guests. And he was freindly as expected, and very conversational. Everyone had a good time. To this day, I still don’t know where Drury Woodson James came from. But I sure am grateful he showed up. 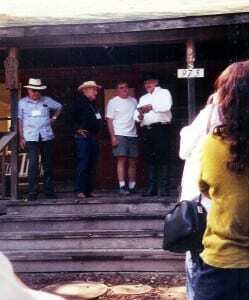 The third video in our series of “home movies” from the Jesse James family reunion in 2002 is now available for viewing. 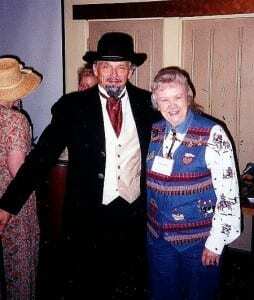 In this one, I offer a half hour presentation, talking about Jesse’s uncle Drury Woodson James, who founded Paso Robles, California, and who almost became governor of California, had not his wife Louise stopped it. 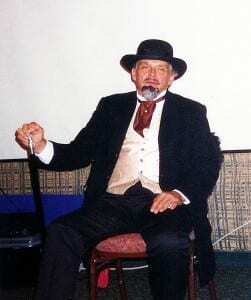 My talk was based upon the slide show about Uncle Drury that I had published on Stray Leaves in 2001. Our technology setup at the Paso Robles Inn went awry, and I could not project the slide show on the screen behind me. That’s why you see me reading off the small screen of my laptop, and why the various reference slides pop up in the video from the slide show. You still can review the slide show at your leisure, and read the text that accompanies each slide. 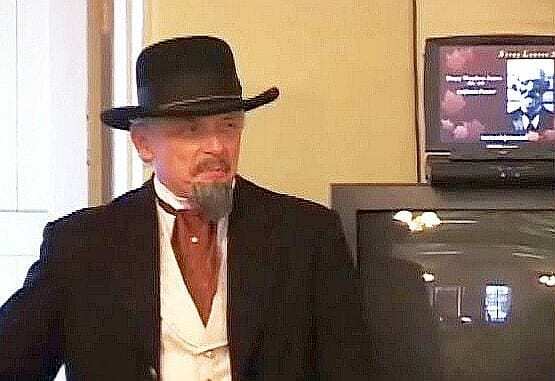 This video also will give you a preview of Volume V of Jesse James Soul Liberty, which will be devoted entirely to the biography of Drury Woodson James, far more comprehensively than you find in either this video or the slide show.